The Importance of Onsite Forklift Certification, Los Angeles, CA – If you’re in such industries as manufacturing, construction, transportation, or the like, you probably know how beneficial and valuable forklifts are for business operations. These powerful tools allow your business to move and store products and material efficiently, but only when done safely. Unfortunately, primarily due to operator error, OSHA estimates forklifts cause on average 101 fatalities, 95,000 injuries, and countless product and property damage annually! These numbers are substantial, in particularly, when considering the risks, liabilities, and costs applied to a business. So what can be done? The answer is a lot simpler than you may think. It requires OSHA compliant training and proper onsite forklift certification. Since forklifts are such an important component of a business, they demand knowledgeable and experienced operators. In other words, you as an employer must ensure that your operators are properly trained to operate, maneuver, and control the equipment safely and correctly. In fact, per the Labor Code and OSHA, forklift training is a must for any forklift operator, as every forklift operator must be trained to operate a forklift competently and safely. All these, and other reasons, may call for forklift training. But as an employer, what’s the best way to have your employees trained? The answer is Onsite Forklift Certification! Onsite forklift certification can be provided as a training program to license newbies or as a refresher course. Either way, it can ensure that trainees will learn how to operate specific forklifts safely, properly, and efficiently in the actual work environment that they need to get familiar with. For an employer, onsite forklift certification is quite advantageous. First of all, it’s the most effective way to save the company money, as you don’t have to send your forklift operators offsite to a school, where they’ll be away from work, risk halting production, and potentially still requiring you to pay them during such time. Second, since the training will be offered onsite, at your company’s location, it can be customized to increase its effectiveness for your needs. 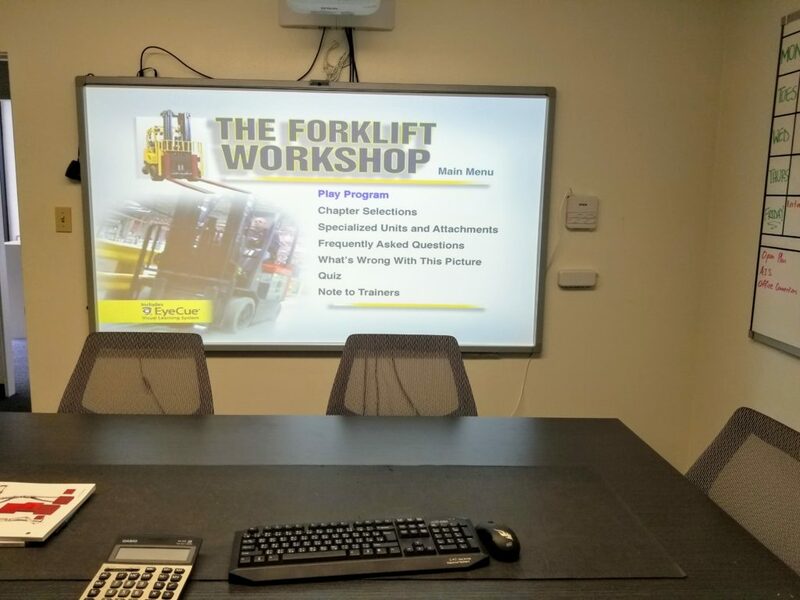 The forklift trainer can tailor the course to the types of forklifts operated onsite, thus ensuring your employees are better oriented with your specific equipment, policies, rules, and needs for safety and productivity. Furthermore, it allows for lowering equipment preventative maintenance costs, limiting unnecessary maintenance expenses, and creating forklift operators who are more familiar and comfortable with your workplace’s actual environment, thus further reducing chances for hazards, risks, and accidents. Third, as an employer, you’ll maintain better control over monitoring your trainees and tracking their progress with onsite forklift certification. Fourth, case studies indicate that generally, forklift operators are more confident in their jobs when trained onsite, thus producing more productive and efficient workers more capable of finishing more work in less time. Fifth, onsite forklift certification creates a great opportunity for trainees to begin interacting with personnel, whom they will be working with, thus better acquainting them with company processes and expectations. Here at American Forklift Certification, out of Los Angeles County, we offer quality and affordable onsite forklift certification. We urge that if your business entails the usage of forklifts, you contact us about our comprehensive, Same-Day Onsite Forklift Certification course offered for new trainees or as a refresher.